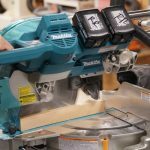 At first glance you’ll notice that the Makita 10″ Dual-Bevel Sliding Compound Miter Saw is cordless, and has a smaller footprint than most miter saws. You’ll also notice that its rail system looks, well, different. Right off the bat I’m thinking this saw is perfect for placing on a work bench, up against a wall or even in a cramped jobsite or how about in a commercial hallway. 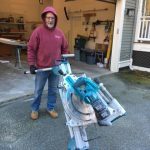 Interested to see what this saw was all about, we mounted it onto the Makita WSTo6 compact miter stand, and took it to our job site to evaluate it. 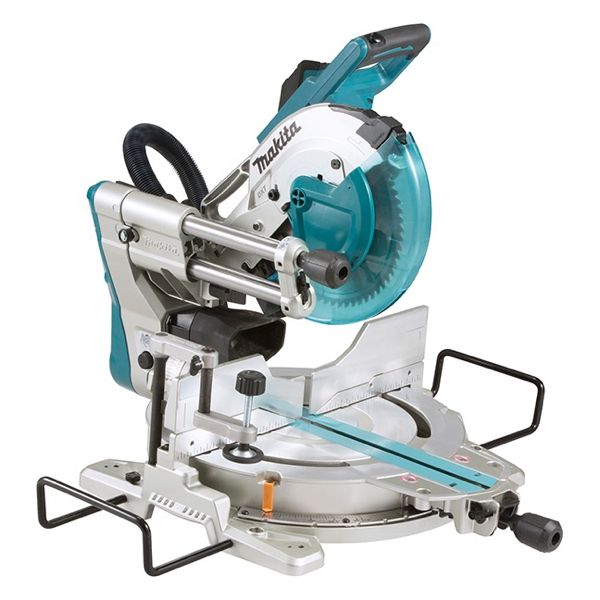 The Makita 10″ Dual-Bevel Sliding Compound Miter Saw has a direct drive, soft start brushless motor. Makita has a long history in direct drive motors. A direct drive motor is the most efficient transfer of power. It does not have the slippage of a belt driven motor. 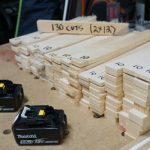 It’s typically associated with a more accurate, responsive and efficient cutting process. An electric brake works well at stopping the blade quickly. The direct drive gear system (not belt-driven) is a big advantage as it is a most-efficient transfer of power from the motor to the blade. 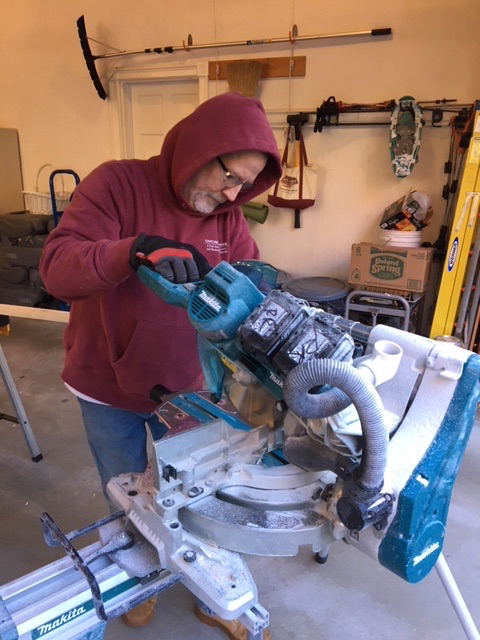 My first impression using the Makita saw was how powerful and smooth it was to operate. 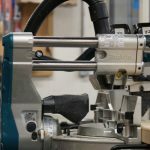 The brushless motor delivers up to 4,400 RPM for fast and efficient cutting, with automatic speed change technology to adjust cutting speed and torque under load. 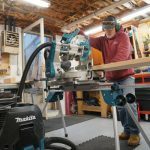 The Makita miter saw has a unique 2-steel rail sliding system design that offers a smooth slide-glide operation, as well as a reduced overall footprint that allows the saw to be positioned flush against a wall. 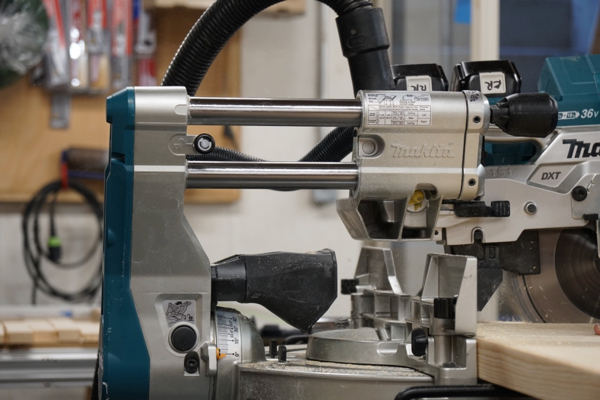 Makita reduced the rails from four to two, and increased their diameter 20% making a sturdier, rigid, and more robust rail system. Inside the slide-frame are diagonal lines of ball bearings and are the secret sauce for the smooth glide of this saw head. We were impressed, and feel that this is an effective design and one that we will be watching closely, over time. 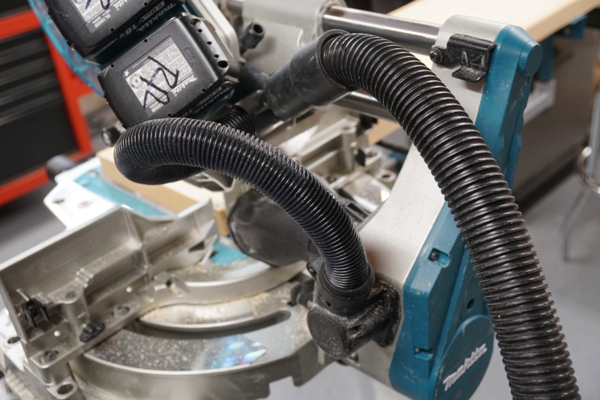 The Makita saw has a switch that operates a laser on the LEFT side of the blade. The laser is “dead accurate,” and bright enough in most daylight conditions. Inside of a house its very bright. Lasers are a funny thing. Most contractors don’t like them, because for many years, they were not reliable and finicky to adjust. This laser is none of those things. Note – the laser is an on/off feature. There is no “auto shut off” feature. It will stay on as long as there are charged batteries in the tool. We left the laser on a few times overnight. I spoke to Makita and they said that the laser draws minuscule power and it is not an issue. 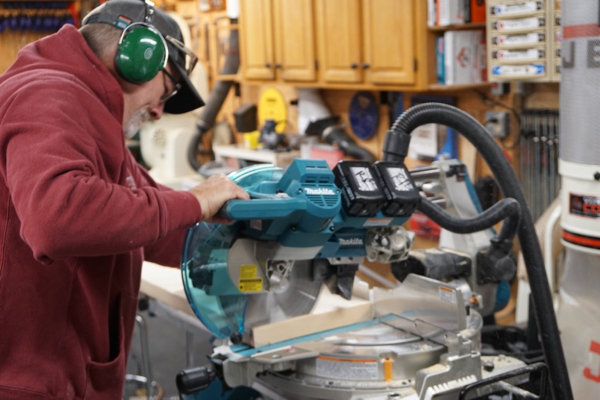 Two words, “Up-Front!” All of the Makita 10″ Dual-Bevel Sliding Compound Miter Saw controls, including the bevel adjustment, is up front. 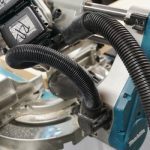 Makita recognized that their peers and competitors are all going to up-front controls – this is what users are asking for. The saw miters 0° to 60° left and right, with positive stops at 0°, 15°, 22.5°, 31.6°, 45° and 60° (left or right). The bevel lock is located in the front of the saw for easy access and quick adjustments from 0° to 48° (left and right). There is a bypass lever to achieve a bevel greater than 45°, which we liked. Overall this saw is equipped with premium miter saw features. In the past, dust collection was not a focus for tool manufacturers. I’ve felt that dust ports were like LED lights, tool manufacturers threw them on a tool to say they had the feature. Dust ports, like many LEDs, neither worked well, nor are they efficient. Today, that’s changed, and many manufacturers are pushing innovation toward it. This is all driven by user requests and demand. The trend, without a doubt is to make tools more efficient at capturing dust. We’re seeing it now with silica dust and also can appreciate having less mess to clean up at the end of the day. Additionally, when remodeling, an effective dust extraction system is a SOLID tactic to prevent dust from spreading to other areas of the home. We all know that dust inevitably finds its way beyond the remodeling area and settles on all horizontal surfaces and duct-work. So anything we can do to reduce that prevents additional clean up and makes us more professional. Makita recognizing this trend for improved dust extraction, worked to improve their dust collecting process. 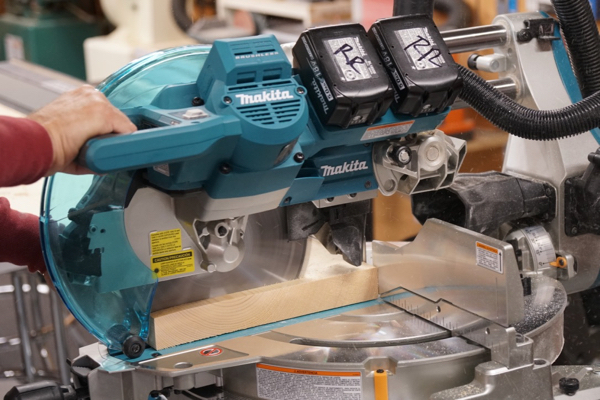 The Makita 10″ Dual-Bevel Sliding Compound Miter Saw has a dual-port dust capturing system. This is evidenced by the two dust tubes and large dust collecting mouth, behind the blade, at the base table. 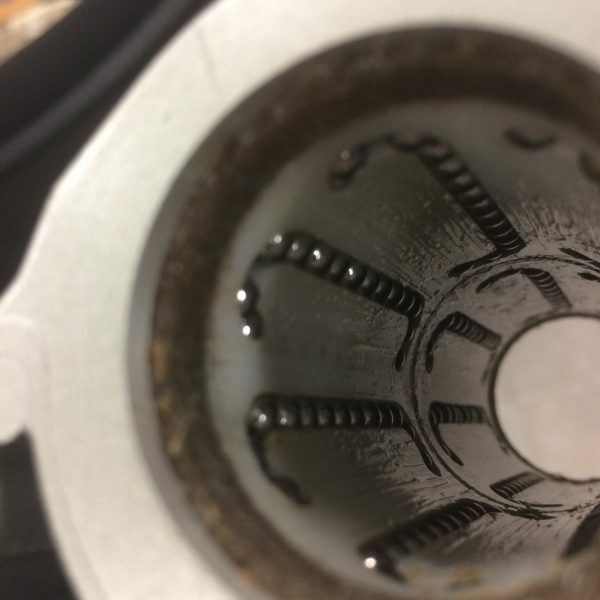 When connected to a dust extractor this saw captures wood dust exceptionally well! During our runtime test we lost very little dust on then saw and shop floor. Most of it ended up n the vacuum. 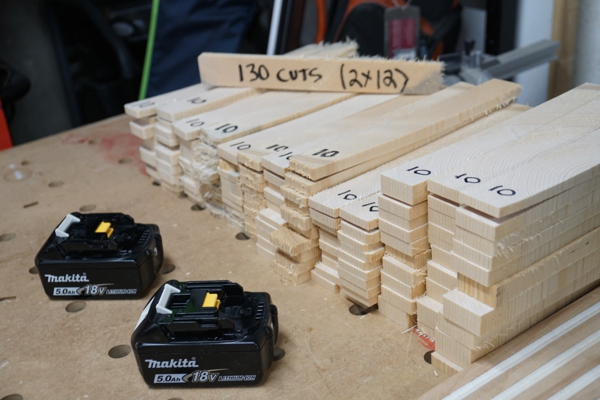 We used the saw for an entire week making cuts off and on all day – there were zero issues with runtime. 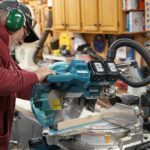 Like any cordless tool, if you’re going to be using this tool under heavy cutting demands, you’ll want a spare set of batteries to swap out and alternate charging. 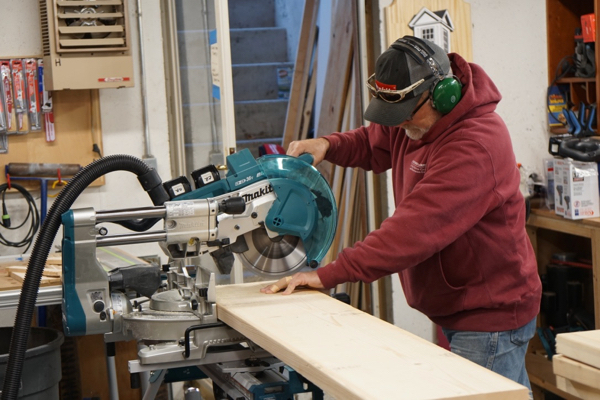 We also tested the saw in the shop, where we achieved 130 cuts in 2 x 12 lumber. The saw blade came to a complete stop after each cut. We took approximately 5 seconds to make a cut. We then took approximately 5 seconds to reset the wood, and made another cut, for a total of 10 cuts. We rested the saw 1-minute every 10 cuts, until the battery failed to make a complete cut. One thing that we noticed when checking the battery gauge and the fuel gauge on the tool is that they did not correspond. the tool showed two bars and the battery showed three. Note – you do have to remove the fence in order to bevel this saw. Removal is fast and intuative. 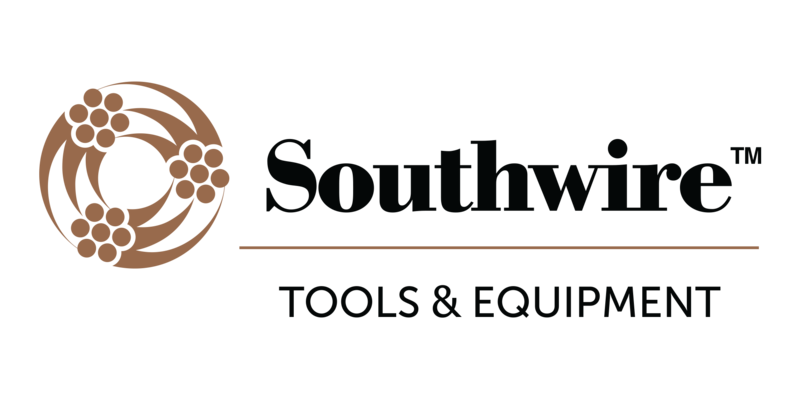 This saw is lightweight and compact, it weighs 60 lbs. 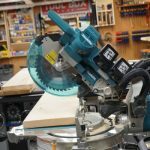 Makita was able to make this a compact saw while still making it sturdy. All of the controls are solid and well done. We love the saw head rail and saw head hinge pivot lock. Both are spring-load and a WAY BETTER design than a plastic twist knob. The storage lock on the saw is solid and held well. This lock fails to hold, during transport, on other saws I’ve used. We also liked the angle adjustment. As your angling the table base you can feel ad hear click as the saw smoothly, indexes through each angle. Nice touch! There is no doubt that this saw designed for pro contractor and capable to be used daily, under rugged conditions. 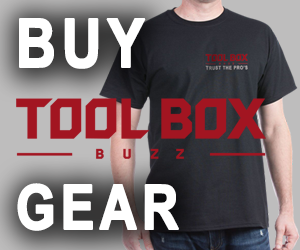 I’m a big proponent of tool manufacturers maintaining a platform. Makita stayed in their 18-volt platform by designing this too l to use two 18-volt batteries. We used this saw on a whole house window replacement. On this job we cut a variety of materials. Having the up-front controls was definitely a nice feature, I’ve always hated reaching behind the saw to bevel it. We found the forward, sliding rail system smooth, it reeks of quality is smooth – there was no slop in the saw head. The forward rails also allowed us to store the saw better in our van and trailer. There’s not much to pick on with this miter saw. I do wish Makita would add a light and a low battery [change battery] indicator on the saw. There is nothing worse than being in the middle of an expensive money cut” and having the saw blade stop. Dewalt designed their light to flash when the batteries are getting low. Maybe they could use that approach? We all commented that having the laser on both sides of the blade would be a worthwhile feature. The crew all commented that they would like a light and the laser on a trigger activation. Like many of the cordless miter saws, I also wish that you did not have to remove the fence to bevel the saw. 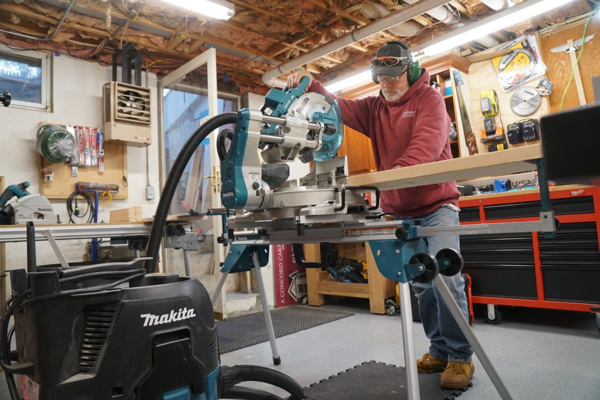 Years ago, Makita WAS the go-to company for woodworkers and carpenters. In the last decade Makita has taken its foot off the gas and clearly lost market share to Dewalt. Well guys, they’re back on that pedal and merging onto the highway! This saw WILL impress you. From its size, power, up-front, easy access controls and intuitive usable design it will NOT disappoint. Great Review Rob!! All the info I was looking for! Looks to be a great saw. I know that you right reviews for the long term but something worth noting is that at the moment if you buy the kit that comes with 2 5.0Ah batteries, the saw, and a charger, you get 2 additional batteries included with the saw…All for $649. Now thats a great deal in my book. 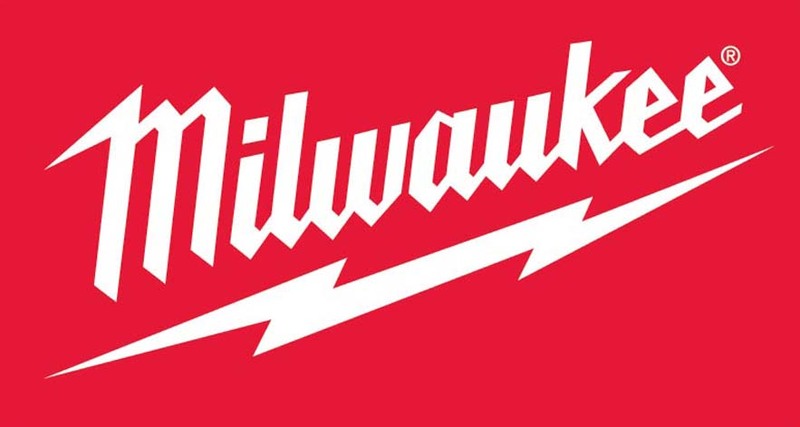 Looks like I will be buying a new Makita 36V 10″ miter saw tomorrow. Hey Rob. 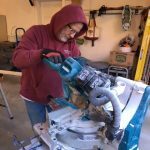 I purchased one of these saws partly due to your reviews. I really like the saw. it was spot on accurate out of the box and is just nice to use….. so smooth. One significant design flaw that I have found and the guy I spoke to at Makita confirms is that makita doesn’t offer a functional set of crown stops for this saw. Makita does offer stops, but they are essentially worthless in my opinion as they need to be moved around as miter angles are changed. If you have any info related to this issue or can figure out a good “work around”, I’d love to know. 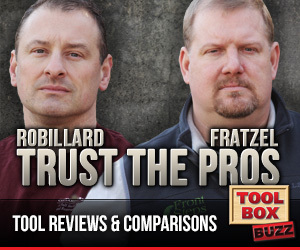 I REALLY enjoy your YouTube videos, especially the tool reviews. You guys are true pros and I for one trust your opinions/reviews. Keep em coming.